What Is "Adjusted Age" or "Corrected Age"? | How Do You Do It? What Is “Adjusted Age” or “Corrected Age”? 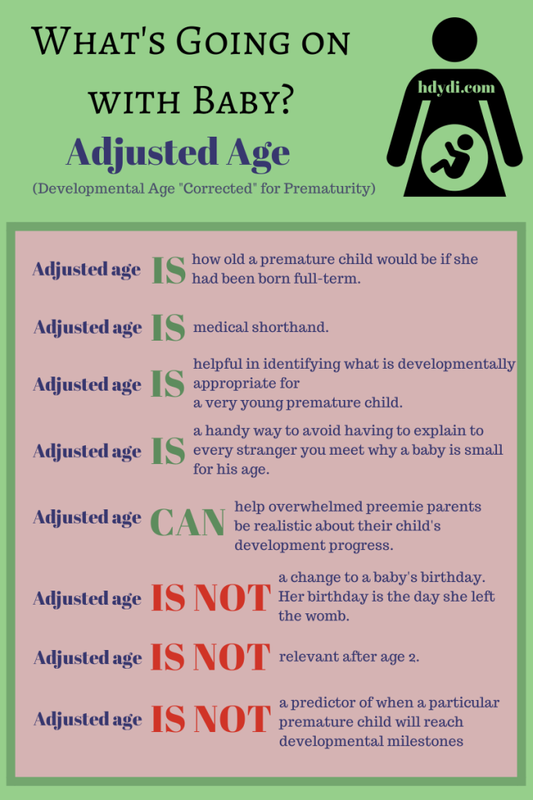 I recently witnessed an extremely heated and sometimes mean-spirited discussion of the term “adjusted age.” One side felt that the term was derogatory to preemies, while the other side felt that their families’ experiences with prematurity were being flippantly dismissed. Of course, it all boiled down to a misunderstanding of what “adjusted age” (or the synonymous “corrected age”) means. I’d like to set the record straight. A premature baby’s adjusted (or corrected) age is medical shorthand for how old that baby would be if he or she were born at full-term at 40 weeks gestational age. What’s gestational age? The time since mom’s last period. Why since her last period? Because until relatively recently, that was the best indicator we had of when pregnancies began and it’s become a cultural norm. 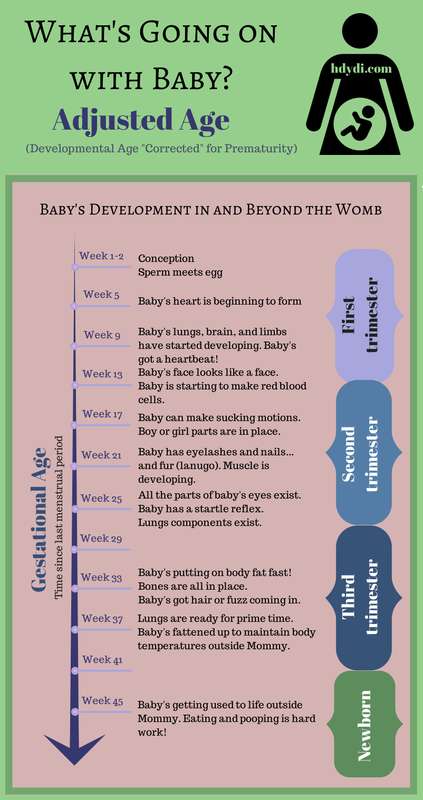 When a baby is born full-term, we don’t pay particular attention to the predicted due date. After all, 95% of babies don’t show up on the due date. The full-term birth window is two weeks on either side of that date. There’s nearly a month of wiggle room in there! I’ve seen due dates wonderfully referred to as guess dates. So why would anyone care about a premature child’s gestational age? It comes down to development. As any parent knows, every kid is on his or her own schedule. Still, there’s a general order of operations when it comes to human development. We start out as one cell and end up becoming neurotic adults. All that happens in between is pretty well understood by the medical and scientific establishment. Exiting the womb ahead of schedule doesn’t much impact that developmental schedule beyond putting pressure on immature systems to perform maturely. Take my daughters, J and M, for instance. They were born at 33 weeks gestational age. They were born with spectacular heads of black black hair. They also had furry ears, foreheads and shoulders. The lanugo, or fetal body hair, that babies have in utero had yet to fall out. It didn’t get the memo that they’d been born. It was just doing it’s regular 33-week thing. This is J at 1 day old. Or should I say “-7 weeks adjusted”? She’s adorable, teeny tiny, and rather furry. Adjusted age. That’s what we were talking about. Let’s put prematurity aside for a moment. Imagine a 1-month-old. This baby can grasp something placed in his hand, but forget about him picking something up of his own volition. He’s probably rather bobble-headed, thanks to brand new neck muscles. Now, compare him to a 3-month-old. She’s not quite so bobble-headed, can get her hands in her mouth with ease, and swipes at toys and Mommy’s phone with gusto. Two months makes a huge development difference in that first year. Now imagine my 33-week preemies. At 3 months old, they’re still as bobble-headed as the 1-month-old, because as far as their physical development goes, they’ve had as much time to develop from that single first cell as a 1-month-old. When it comes to predicting how much they should weigh and what they should be capable of doing, the pediatrician and I strike a balance between their birth age and their developmental (adjusted) age. The adjusted age for a child born prematurely is measured from conception and takes into account that they’ve had less time than their birth-age peers to get up to speed. That’s all there is to it. By age 2, there’s really no reason to use adjusted age any more. There’s not much that distinguishes a 24-month-old from a 26-month-old. By age 2, preemies are caught up, developmentally, to their birth-age peers, barring complications. As with the term “identical” twin, the non-technical meaning of the word “corrected” in “corrected age” (which is the term my kids’ doctors all use) leaves the concept prey to misunderstanding. So let’s all hug and make up. Great discussion! I think you may have made an error in your first diagram. I believe “week 1” is from the start of the last period which, technically, is about 2 weeks before fertilization of the egg. Because the start of a menstrual period is easily identifiable (whereas the day of fertilization is not), I believe the date of pregnancy is actually counted from 2 weeks prior to fertilization. Thanks for the catch, Sarah. I tried to capture the variation in egg release (and subsequent conception) by giving a range of time in which conception could occur. So I’m going to stick with it happening in Week 1 or 2, which is what I meant by labeling that time “Week 1-2”. The diagram is great. I just misunderstood the labelling! I have twin granddaughters born at 26 weeks. They are now 9 months old and their doctor just gave them their adjusted age as 5 months 21 days when he was testing them for developmental growth. He said they are both doing great – no concerns except one favors her right side and one her left (mirror twins) and to try to get them to work both sides equally. He also said that the hospital he is at uses 3 years now for micro twins to be caught up, not the 2 years as before. The hospital is Milwaukee Children’s Hospital and has the NICU that was rated best in the Nation. 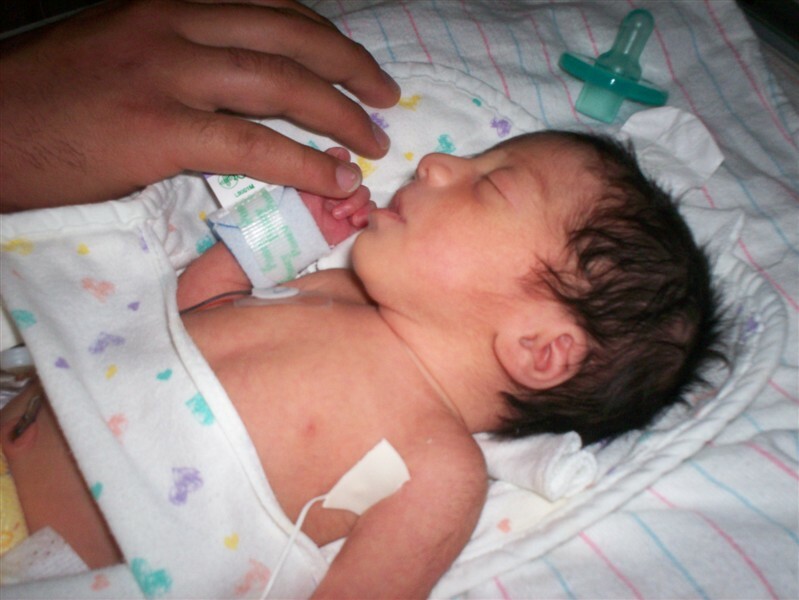 Have you heard of this change for micro preemies adjusted age, or is it just this hospital? Hi, I saw the infographic on pinterest that brought me here to read this post. I LOVE IT! I am a pediatric physical therapist with a new facebook group for parents of preemies. I am going to share this post with them and on my business facebook page. I’ve done 3 drafts of a post talking about adjusted age and you nailed it in just a few short sentences! Come check out my blog everythingbabies.org, or the new support group if you’d like http://www.facebook.com/groups/PreemiePower Cheers!